Believe it or not, I don’t cook. That’s right – I mooch. I live at home and eat my mom’s cooking. I make a salad every day for lunch, but I don’t consider this cooking. I go out and pay restaurants to feed me. I have not cooked or baked anything since the Great Food Blogger Cookie Swap in December. 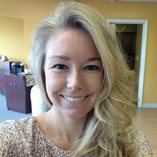 Talk about working backwards…this is me on Easter Sunday with the finished product! But this year Easter was being celebrated at my house, and I felt like contributing. I felt domestic. 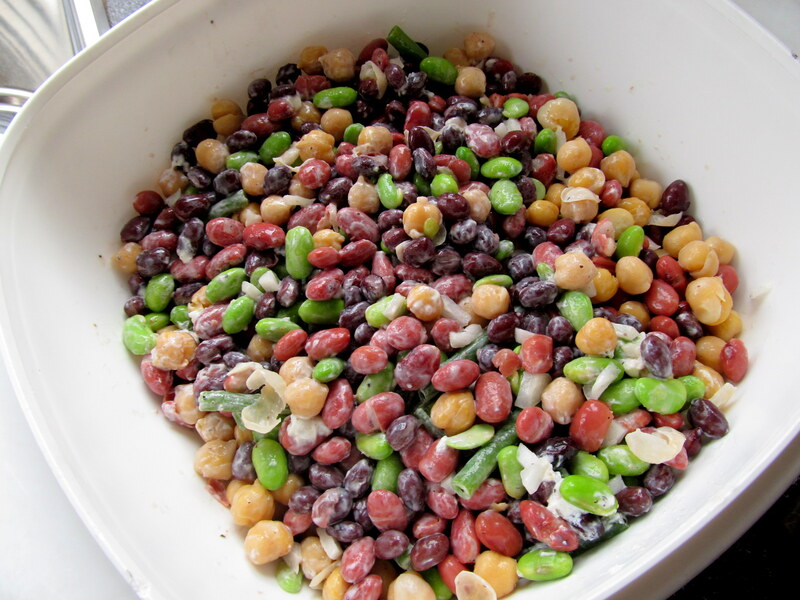 And thanks to Lisa, I felt inspired when I was reading her blog one day and saw that she had posted a recipe for a Five Bean Salad. Missing from this photo are olive oil and frozen shelled edamame. I followed Lisa’s recipe, but used goat cheese instead of feta. I love feta cheese, but goat is my favorite! 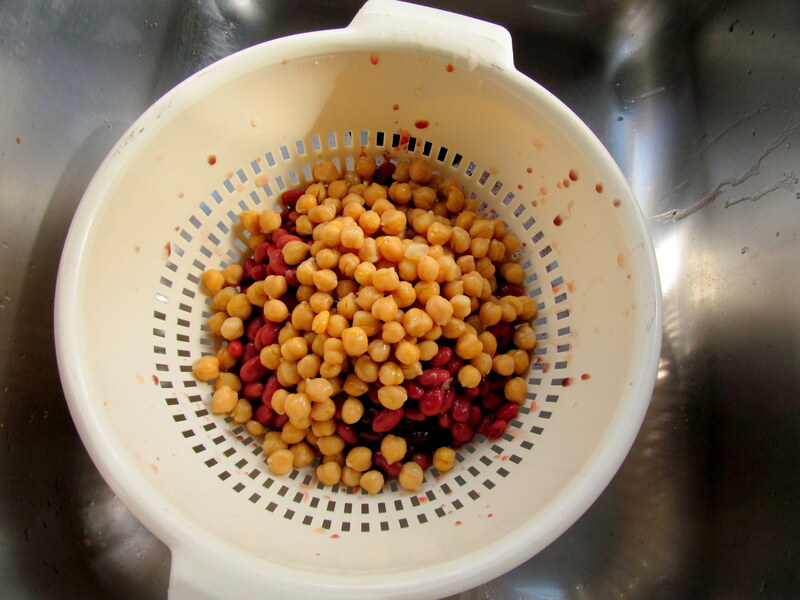 I started by rinsing and draining the chickpeas, kidney beans, and black beans in a colander. 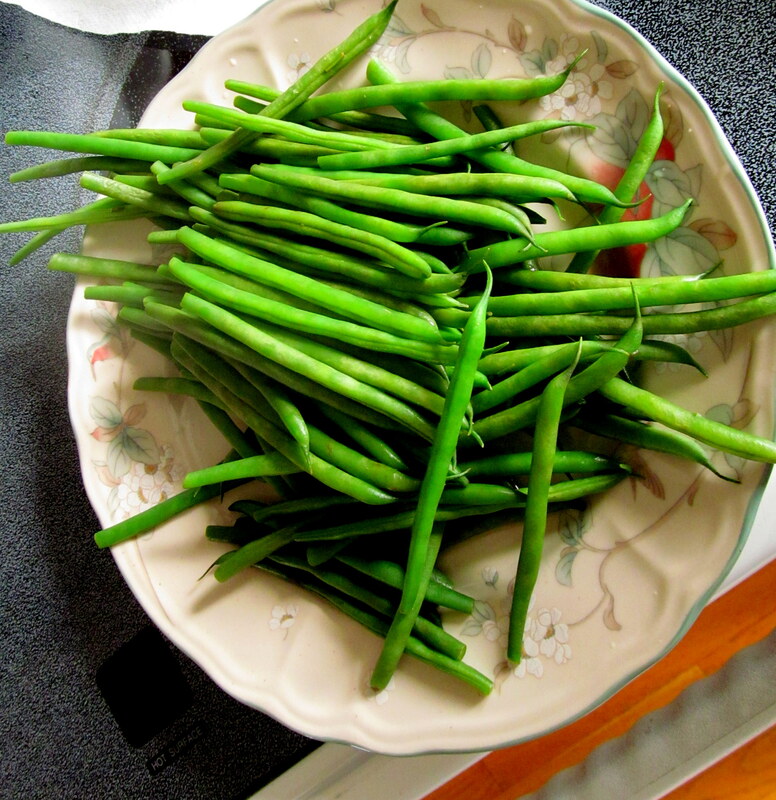 The above green beans came in their own steam-able bag, so I microwaved them and set them out on a plate to cool off a bit. Per Lisa’s instructions, I cut the ones that were going into the salad in half and also cut the “string” ends off. 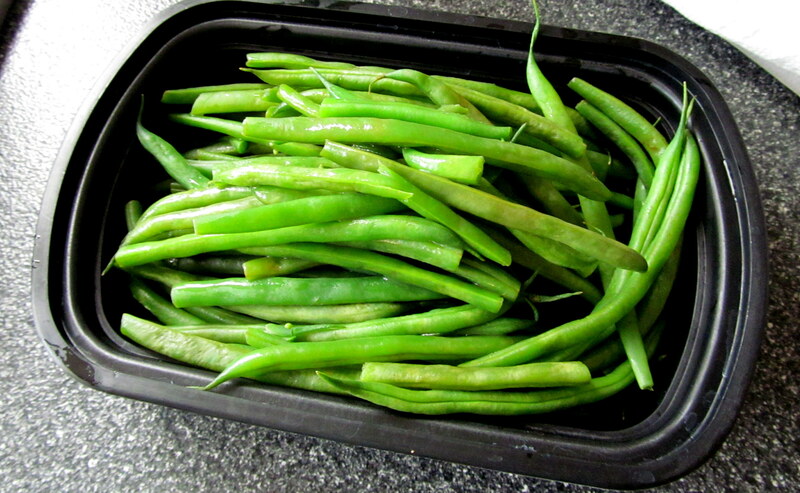 I smugly put the rest of the green beans in a container to use throughout the week. 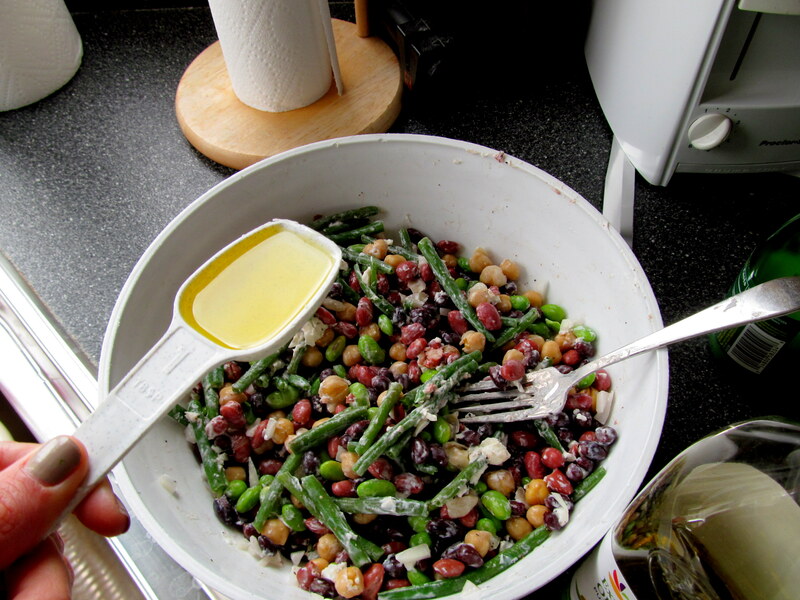 In fact, I added them to both yesterday and today’s lunch salads, and last night’s dinner too! Helps to be prepped when eating healthy. 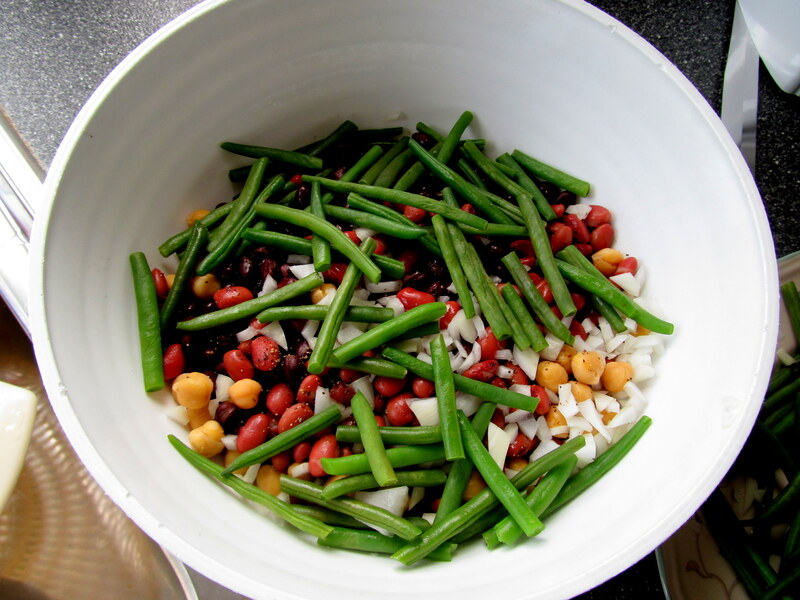 I added the green beans to the other three beans in a mixing bowl, and threw in minced onions, salt, pepper, and lime juice as well. 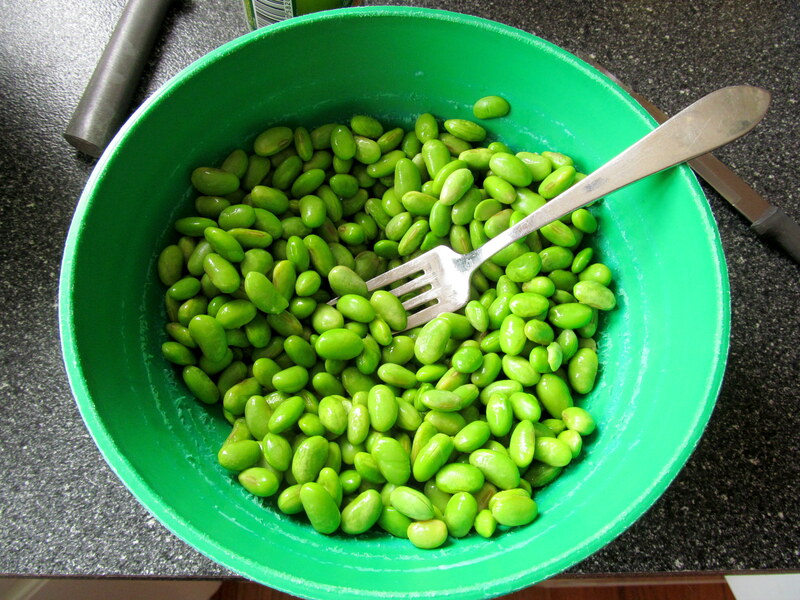 Then it occured to me that I’d forgotten to prepare and include the frozen shelled edamame. D’oh! It was super easy to defrost in the microwave. 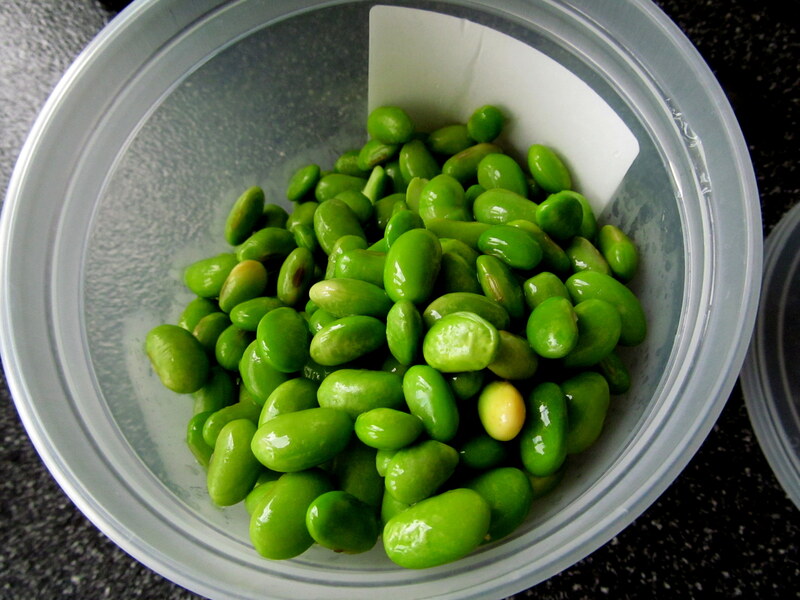 I’ve never bought edamame before, I just eat it when I’m dining out at Asian restaurants or at my local Whole Foods salad bar. I think I’ll have to reconsider. MORE smug leftovers that I’ve been nommin’ on already! I added the edamame and then the GOAT CHEESE. Of course I saved the best for last! 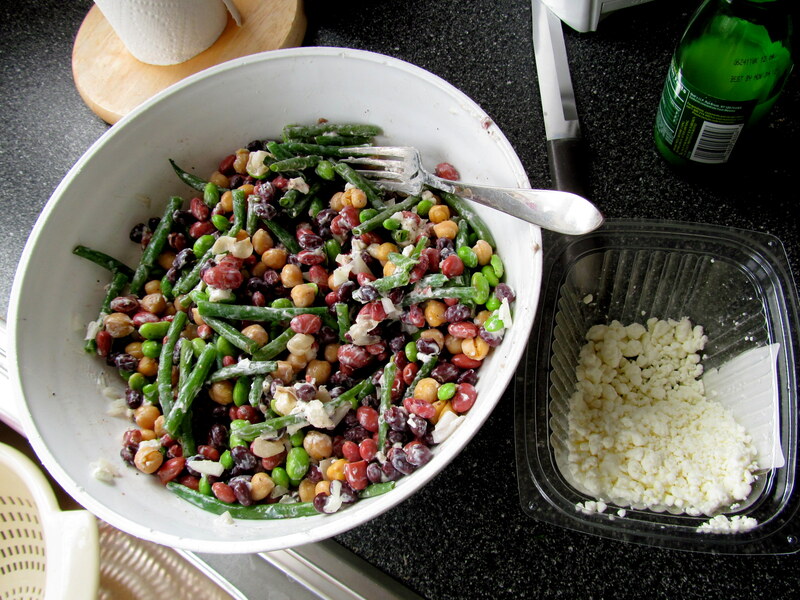 An unexpected perk that came from using goat instead of feta – goat cheese has a creamier consistency and totally coated all the beans (yes, all five types ;-)). Win! This forgetful cook was then reminded by her mother that she’d forgotten the olive oil. First the edamame, now this! Can’t forget that EVOO. I added 1.5 tablespoons. TA-DA! Was there ever an easier side dish for a non-cooking moocher like me to make?! I don’t think so! I let it veg (ha – punny) overnight in the fridge. I also didn’t try it before I served it. Yes, I like to live on the edge! Or…that thought didn’t even occur to me. I am NOT used to cooking, I told you! The results though? Everyone LOVED the dish. There was barely any left but I’m honestly glad there was some because I was able to finish it off at dinner last night 🙂 mixed with extra green beans, edamame, black beans, marinara sauce, and turkey meatballs! It was what I like to call a hodge-podge of leftovers. Thank you so much to Lisa for providing such an easy, healthy, tasty recipe for me to make and share with family and friends! How often do you cook? 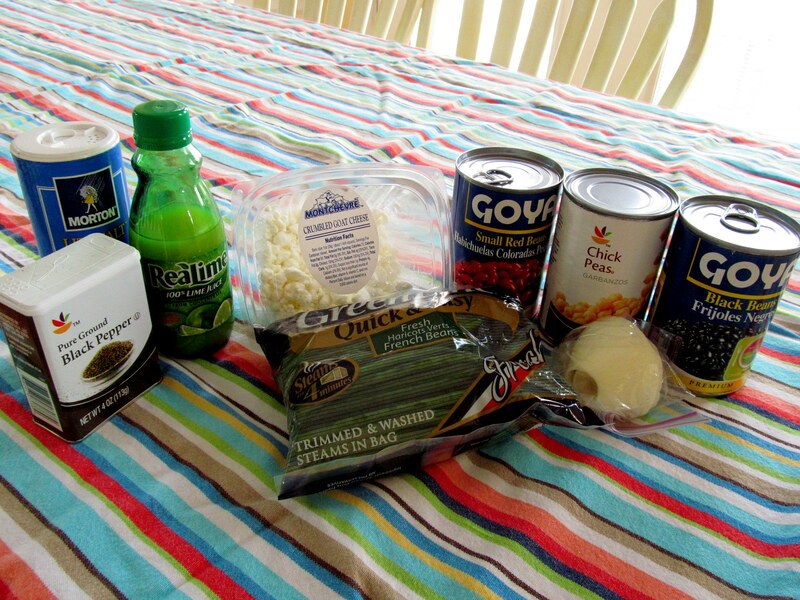 Are you a “fraud” aka a food blogger that doesn’t cook, like me? 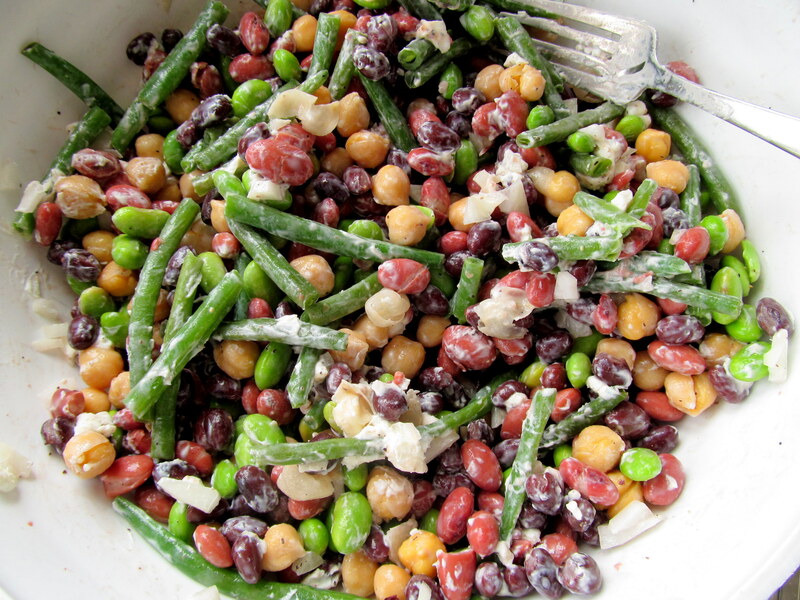 What are your favorite healthy dishes to bring to parties?